The 225th and last Ethiopian Emperor, Haile Selassie was born in Ethiopia in a region called Ejersa Gora on 23 July 1892. His birth name given by his parents was Lij Tafari Makonnen. He was the only surviving son of the governor of Harar, Ras Makonnen Wolde Michael. Selassie traced his linage back to Menelik I, who was credited with being the child of King Solomon and the Queen of Sheba. He was raised a Christian and educated by private European tutors. His father passed on in 1906 and was taken under the wing of his uncle Menelik II who did not have a son to succeed him and Selassie I appeared to be the favoured successor. He spent his youth at the court of the emperor of Addis Ababa. He was exposed to political plots and learned about the use of power. The capacity of his memory, mastery of detail and hard work earned him the position of governor of Gara Muleta in the province of Harar at the age of fourteen. At the age of twenty Menelik II appointed him as commander of the extensive province of Sidamo. However his anticipated succession of Menelik II never took place as after the passing of Menelik II in 1913, his grandson Lij Yasu who was not a Tafari succeeded him. Yasu’s religion Islam cost him his leadership position as he maintained close ties with Islam in a Christian dominated country and he never gained favour with the Christian population. Selassie became the face of the opposition and later took power in 1916 and imprisoned Yasu for life. In 1917 Menelik II’s daughter Zauditu contested the throne and became Empress and Selassie was named regent and heir to the throne. As the emperor he became a symbol of hopes and dreams of his country, trying to place his young country in the map. As a leader his power increased, he led Ethiopia into the League of Nations in 1923 and by travelling to Europe, a first for an Ethiopian ruler in 1924. The empress showed less interest in politics but in religion, which was opposite to Selassie whose interest was in turning the country into a more modern one. He became stronger when he took control of the army in 1926, and this position allowed him to assume the title of king. 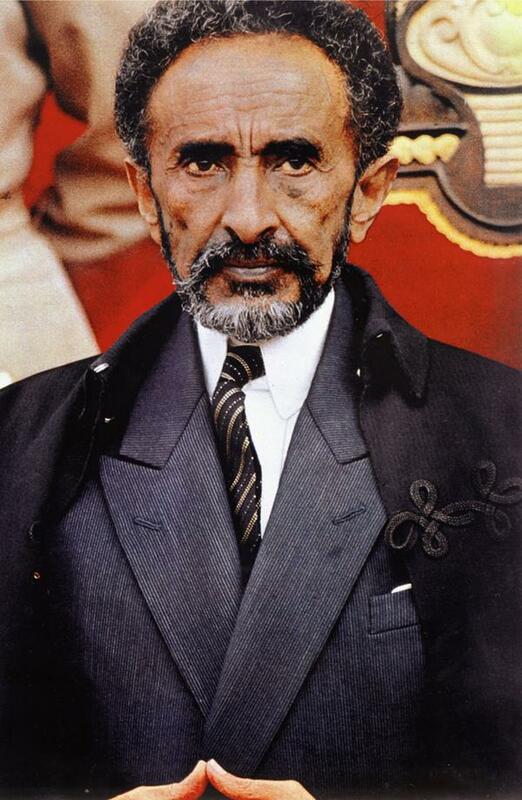 In 1928 he became a self-proclaimed king and after the death of Zauditu in 1930 he demanded the title of King of Kings and took the name Haile Selassie (Might of the Trinity). The forty years of his power over the country and government led to him instituting a new constitution and centralizing his power. In 1935 his efforts were cut short when Benito Mussolini’s Italy invaded Ethiopia. He resisted the invaders with some of the feudal lords supporting him and others siding with the invaders. Selassie sent troops to Tigray in 1936, his army claimed a victory at the battle of Tembien, however, the victory was short lived as the Italians overcame them by using mustard gas after the battle. The Ethiopian army retreated to Maychew and this was their final stand. Afterwards, Ethiopia lost its national independence. The following year Selassie was forced into exile. The Ethiopians continue fighting the Italians by waging guerrilla war. During the war, he remained in exiled and banded his country together to fight the Italians. For aid, he appealed to the League of Nations but was unsuccessful. He then went to British for help. In 1941 the British finally came to his aid and freed the country from the Italian control. He returned to claim his throne. On his return to his country, he found his administration destroyed. He dedicated himself to rebuild his administration and improving Ethiopia’s defence. Progressively many youngsters were sent to study abroad and learn what they could from other cultures. He improved the infrastructure of the country and backed by the Western powers he managed to build bridges, hospitals, factories and schools. He was viewed as a reformer by many. Despite being a reformer he ruled with an iron fist. He became paranoid about the partisans who had stayed behind and fought the Italians. He was intimidated by their bravery and decided to remove them from the position of authority and replaced them with those who collaborated with the enemy (Italians) because he knew that they could be kept easily in line and would be open to the methods of Selassie. His methods of maintaining power involved financial rewards and promotion of government officials. He gradually grew more cautious and allowed few new leaders into his new government. In 1962 he managed to absorb Eritrea into Ethiopia. In Ethiopia, all was not well. He suppressed political parties and opposition. Ethiopian peasants were starved while he was leaving a lavish lifestyle. Selassie was accused of breeding corruption and the creation of a system in which millions of his subject lived in poverty and oppression. People struggled to rebel with empty stomachs and this seemed to suit him. Media was censored and controlled by the emperor, and Western journalists were no longer allowed in the country. The suffering of his subject was finally exposed and caused great embarrassment to his reign. He exercised absolute control and punished those who questioned and undermined his authority, this led to attempt to a government coup in December 1960. The attempt failed and turned into a bloody massacre that sent a message to possible of plotters of what could happen to them. By the 1970s the situation in Ethiopia had worsened, with unemployment increasing, and the government’s inability to respond to the country’s problems Selassie’s rule was undermined. He lost control over his army as many left the army over low pay. This weakened his defence and as the result, he was ousted from power in a coup. He was kept under house arrest until his death in 1975. The cause of death was disputed; reports claimed he had died of a natural cause but another one revealed that he had probably been strangled to death on governmental orders. His remains were discovered in 1992. He received a proper burial in November 2000 in Addis Ababa’s Trinity Cathedral.